Gyalsé Ngulchu Tokmé (Tib. རྒྱལ་སྲས་དངུལ་ཆུ་ཐོགས་མེད་, Wyl. rgyal sras dngul chu thogs med) or Tokmé Zangpo (ཐོགས་མེད་བཟང་པོ་, Wyl. 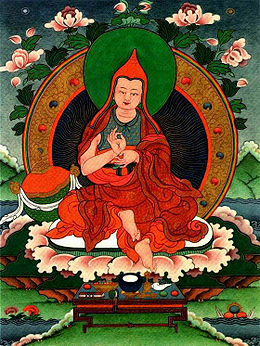 thogs med bzang po) (1297-1371), was born in Puljung, south west of the great Sakya Monastery. He was born in the Wood Sheep year of the fifth sexagenary cycle. An extremely learned scholar, he studied an infinite number of teachings from all traditions. His every instant was devoted to the Dharma which he spread through composition, teaching and debate. He could teach with total confidence on any subject or text. Also, he was able fully to take upon himself the suffering of others and to give them his wellbeing, and without any expectation as to the result, he was extremely generous to all, particularly the poor, the destitute and the suffering. He met buddhas and deities such as Avalokiteshvara and Tara face to face. He taught many of the greatest teachers of his time in Central Tibet, such as Khenchen Lochen Changchup Tsemo (1303-1380), Butön Rinchen Drup (1290-1364), great Sakya masters and so on. He was served as abbott at the Bodong E monastery. He passed away at the age of 74 amidst wondrous signs of realization. Thirty-Seven Practices of the Bodhisattvas - the famous text on bodhichitta. Ocean of Good Explanation - a commentary on the Bodhicharyavatara, which Patrul Rinpoche would often take as a basis for teaching the text. For a more extensive biography see The Heart of Compassion, by Dilgo Khyentse Rinpoche, Shambhala Publications, 2007, pp.11-26, and see p.232 for a list of his works. This page was last edited on 29 May 2018, at 06:16.